The price of coffee is highest at Coffee Bean and lowest at Ediya Coffee, according to an online survey by the Korea Consumer Agency, which released the results Wednesday. Starbucks ranked No. 1 in overall satisfaction, scoring 3.78 out of 5, followed by Ediya Coffee (3.72), Coffee Bean (3.71), Hollys Coffee (3.7), Caffe Bene (3.66), TOM N TOMS Coffee (3.63) and Angelinus Coffee (3.58). 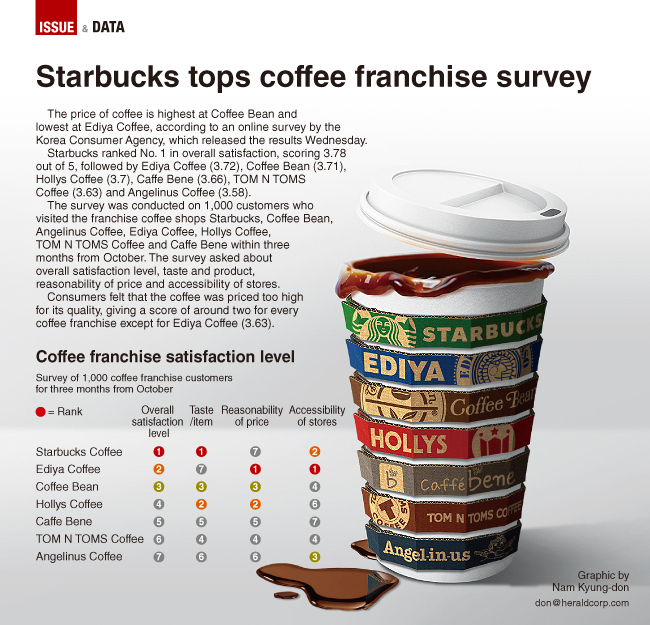 The survey was conducted on 1,000 customers who visited the franchise coffee shops Starbucks, Coffee Bean, Angel-in-us Coffee, Ediya Coffee, Hollys Coffee, TOM N TOMS Coffee and Caffe Bene within three months from October. The survey asked about overall satisfaction level, taste and product, reasonability of price and accessibility of stores. Consumers felt that the coffee was priced too high for its quality, giving a score of around two for every coffee franchise except for Ediya Coffee (3.63). The Korea Consumer Agency further noted that Starbucks, Angel-in-us Coffee, Caffe Bene, Coffee Bean and TOM N TOMS Coffee do not indicate the amount of caffeine content, which is highly advised.